The 2017-18 school year has come to an end, and so too has another successful year of athletics at SMS. Pride of place goes to all the athletes and coaches involved this past year, we had some stand-out performances by both individual and team athletes. Most notably, the number of athletes participating in athletic endeavors across the board. Strong finishes in rowing, cross country/track, triathlon and swimming have put SMS on the map as a little school to watch out for. The recent Athletic Awards was a night to celebrate all those involved in another great year, including coaches, parents and supporters. Congratulations to all those involved. 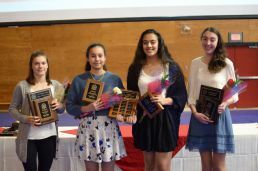 New this year, the Athletic Service award looks to acknowledge a student at SMS that best exhibits the school motto ‘Servite in Caritate’, ‘Service with Love’.